With the inspiration of Vikasa Tarangini Seva CEO HH Sri Chinna Jeeyar Swamiji, Vikasa Tarangini Vizag Youth has successfully conducted a ‘Walk For A Cause’ on ‘Organ Donation’ Awareness. The Program has started at 8 in the morning with the prayer by Varija vedic students. Dr.VenuGopal and Dr. Srinivas (Nephrologists) spoke about the importance of organ donation which is the need of the hour and shared few instances such as how a brain dead person can donate 32 organs. The Chief Guest of the day Sriman G.Srinivasa Rao (M.D Vaji Communications) has spoken about the involvement of youth in serving the society. Anuradha ( Vikasa Tarangini Youth) has explained the importance and objectives of Vikasa Tarangini Youth to the society and also shared details on how one can become member of Vikasa Tarangini Youth volunteering team. Madhusha and Hemasree (Vikasa Tarangini Youth memebers) have spoken about ‘Saving the Mother Earth’. The stalls of Nethra vidyalaya (School for the visually challenged), enrolment of Vikasa Tarangini Youth and Mohan foundation have been displayed. The walkathon started from A.S.Raja Mahila College grounds MVP colony for about 5Kms. In this walk, students from different colleges were joined by Varija Vedic students, NSS (National Service Scheme), National Cadet Corps (NCC), Nethra Vidyalaya students and Vikasa Tarangini members. Vikasa Tarangini Youth has issued certificates to all the participants. On the same day i.e. 30th Dec 2012, as the programme started Sriman M.S.S.R.Varma ( Vikasa Taranginicentral committee Joint Secertary) came to know the demise of his father-in-law. His spouse Mrs Shireesha Varma took an initiative and coordinated with her mother and brother and donated the eyes of her father (Late D.V.R.K.Raju) to L.V.Prasad eye institute. 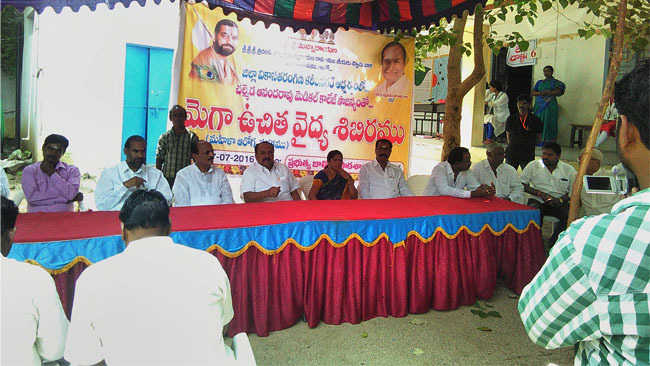 This program was presided by Sriman Ramanujam and organised by Sriman M.S.S.R. Varma, supported by Mohan Foundation Team,Vikasa Tarangini Secretary P.S.N.Raju and Vikasa Tarangini Members VSP.